Chapter 4 is the Results section of your research paper. According to Annesley (2010), "the results section is where you report the findings of your study based upon the methodology [or methodologies] you applied to gather information. The results section should state the findings of the research arranged in a logical sequence without bias or interpretation." As discussed in detail below, Chapter 4: Results must contain the following. Using the T-Test Calculator, create a summary table of your results. Refer to classroom discussion for more information and instruction. An example of a summary table appears below. Using Evan's Awesome Tools, create a graphic that shows the distribution of the control group and the distribution of the experimental group. Refer to classroom discussion for more information and instruction. An example of a Distribution appears below. The Summary of Findings should restate the mean for the control group and experimental group, the difference between the means, and whether there is a significant difference between the mean of the control group and the mean of the experimental group. Below is an example of a Summary of Findings for the results reported above. The mean for the Control Group - No Music was 12.75. The mean for the Experimental Group - Music was 8.5. 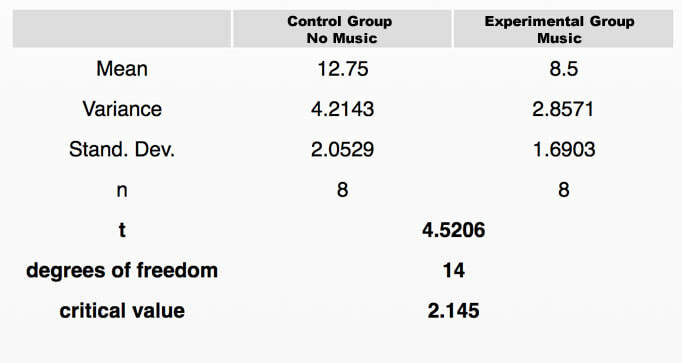 The difference between the music group and the non-music group was 4.25. The calculated value for t is 4.5206. The critical value is 2.145. The calculated t exceeds the critical value (4.5206>2.145), so the means are significantly different.